Chosing to end your pet's life can be a very difficult decision to make. At Wandermere Animal Hospital we strive to help our clients navigate through this process. Our doctors are more than willing to discuss quality of life and help you reach a decision for your pet's specific situation. We perform our euthanasias as humanely and peacefully as possible. If you so desire, we are happy to allow you and your family to be present for the euthanasia process. If you wish to arrange for an in-home euthanasia we can refer you to one of two very compassionate mobile veterinarians by the name of Dr. Tod Kennedy (509 467-2960) and Dr. Lacey Rasmussen (509 931-0466). Cremation Services: We can arrange for either a general cremation of your pet, or if you prefer to receive your pet's ashes back, we will arrange for a private cremation. 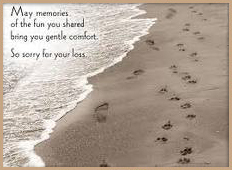 Family Pet Memorial Garden is our trusted partner when it comes to private cremations.